The Sharp family of infrared ranging modules are used extensively for robotics and automatic distance measurement applications. Unfortunately, the output of these sensors are inherently non-linear. In other words, a big change in output voltage does not always indicate a big change in distance to an object. In order to get distance values in common units (e.g. 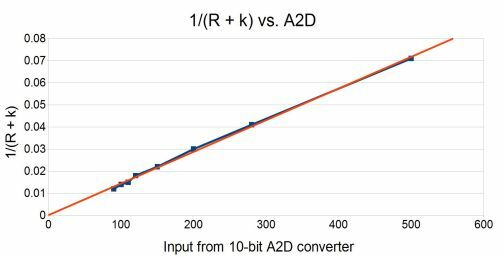 inches or centimeters), a user must derive a function to convert the sensor output voltage into a distance value. Where V is voltage and R is range, the equation produces a very straight line. The inversion (1/x) operation acts as a linearizing function to turn the ungainly curve in figure 1 into a nearly linear curve shown in figure 2. This observation is the key to finding a simple linear approximation function for the output. Comparing equation 5 and 6, m'=6787, b'=3 and k=4. For equation 6, V must be greater than 3 in order to avoid a divide-by-zero error. 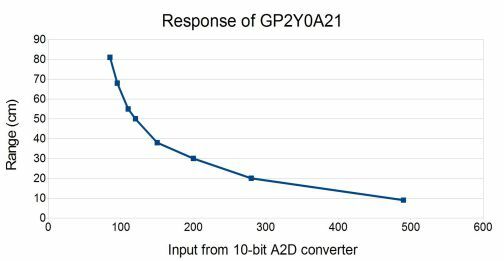 With 10-bit integers, voltage measurements from a GP2D12are typically above 80 when any object is in range. If nothing is in front of the sensor, the readings can drop to 0.